McNary head football coach Jeff Auvinen looked out at the Celtics five league and two state championship banners and told his team how much fun it is to practice on Thanksgiving. 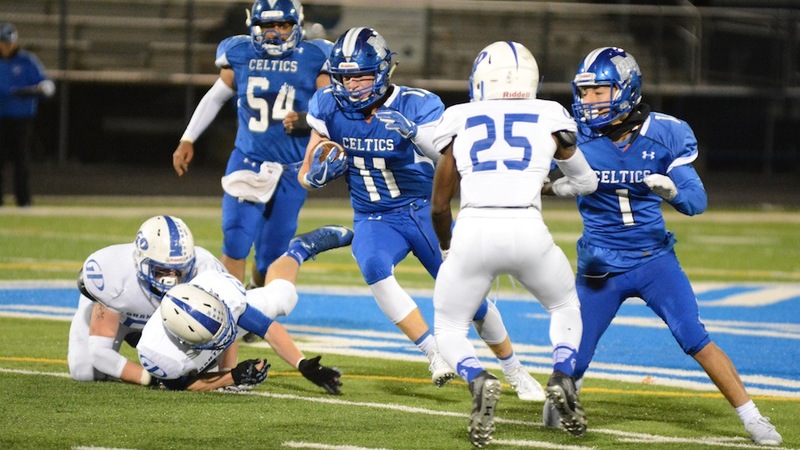 McNary had just won its first playoff game since 2013 but the Celtics aren’t satisfied. In order to continue its postseason run and get to Thanksgiving, McNary must first knock off defending state champion and No. 3 West Linn on the road Friday, Nov. 10. Auvinen compared West Linn to Sprague and West Salem, two teams that combined to outscore the Celtics 119-12 during the regular season. While West Linn cruised to a state championship last season, the Lions lost back-to-back games to Tigard and Lake Oswego this season. One of those seniors was quarterback Tim Tawa, who after being named the state Gatorade player of the year in football three straight years signed a baseball scholarship with Stanford University. While this season’s quarterback, junior Ethan Long, doesn’t have near the accolades, Auvinen sees another good player on film. “He’s athletic. He throws the ball well, especially on timing routes,” Auvinen said. West Linn also graduated defensive back Elijah Molden, who signed with Washington, and offensive lineman Alex Forsyth, who signed with Oregon. West Linn’s biggest 2018 prospect is Keishon Dawkins, a 6-foot-6, 240 pound tight end who has committed to Oregon State. McNary last played a Three Rivers League opponent in the first round of the playoffs last season, losing at Tigard 58-28. But McNary will have to play it best game of the season to pull off the upset.